It can easily be over a year from when you purchase your plot to the day you move into your dream home. Where you live during this time can both reflect on your working day and your day to day living expenses. Depending on how close your building site is to your home it may be possible to live in your home whilst the new build progresses. Will you be working and building in your spare time or perhaps just overseeing the build and continuing to fit in a nine to five job? Your home life may suffer especially if you have a young family who will not understand that mum and dad have a new home to build. There will not be time for running repairs on the home you live in as all spare time will be spent on the new build. Ask yourself this; can you be in two places at the same time and cope with the stress during the self build? Expense can also be a major factor if a mortgage has to be paid and money borrowed for the build. If interest rates start to rise during the build then your build could become a headache with spiralling costs. Some lenders do still offer self build mortgages where the borrower lives in their home which is used as collateral for the duration of the build. The home is sold off after the built to repay the loan. It is worth sitting down and calculating how you can afford to live during the build and at what cost to you and your family in both money and stress. Ideally living on site would mean you were there to work and oversee the development of your new home. You would not need to commute and the build should move along faster with you there at all times. A caravan or mobile home on site could be the answer. Furniture and valuable possessions can be placed into storage so your caravan living is kept clutter free. You would have toilet and washing facilities for any workers on site and the caravan could double as the site office. Security on any building site can be a problem. Living on site could solve the problem. Make your living quarters visible to any passerby as you do not want to put your family at risk by burglars and other undesirables. Fence in the plot as it will also secure bricks and other building materials from the occasional person helping themselves. You will be surprised at how many people think they are free to take a few bricks or a bucket of sand. Security lighting is easily available from DIY shops and if it is triggered when someone approaches you will be in control at all times of the night. If young children are to live on site you must take care that they are safe from machinery and uneven ground at all times. 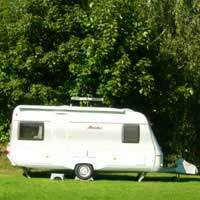 Caravans and mobile homes can be bought second hand and delivered to the building site. Advertisements can be found in many of the magazines for self building enthusiasts. Resell the home when you have completed the build and request that the buyer removes it themselves. Take care that the caravan is not blocked in by your new home. Once the home is secure and you have utilities in place it could be possible to move into the new home whilst you are still finishing the build. With somewhere to cook, sleep and wash you could live in the house and sell your old home thus freeing up money to finish and furnish. You may need permission from your building inspector so perhaps check out that it is permissible before you make yourself homeless.